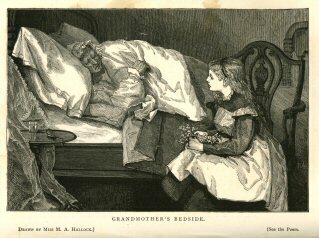 In “At Grandma’s Bedside” Edgar Fawcett discusses old age and the approach of death. 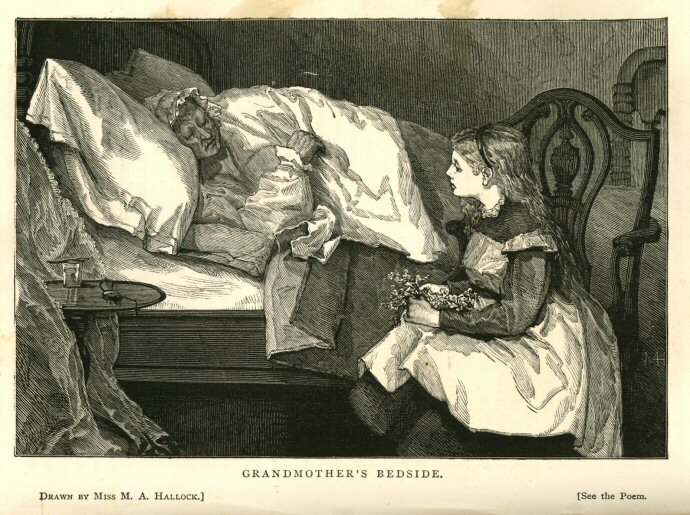 The engraving by Mary Ann Hallock was one of two by her in the May 1870 issue of Our Young Folks. Drawn by Miss M. A. Hallock.] [See the Poem. A bright little nosegay: ’t will gladden her so! But then what a blessing she suffers no pain! So scented with blossoms and merry with sun! We are wearier, feebler, more willing to die. I hoped that the world’s way would mend by and by. But darken by tired old eyes, and not care. And watched by my bedside as I ’m watching here.